Nicole Leigh Shaw, Tyop Aretist: Dear Nicole: When is it okay to eat off of someone else's plate? 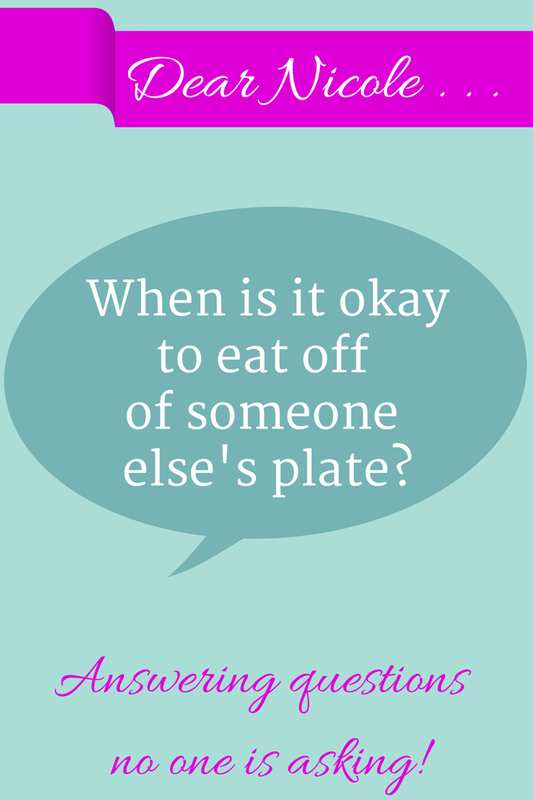 Dear Nicole: When is it okay to eat off of someone else's plate? 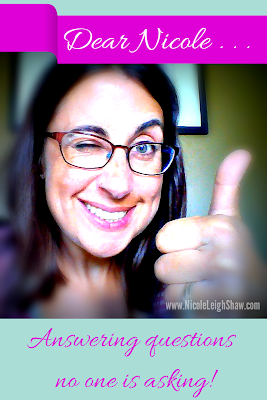 Welcome to "Dear Nicole," the advice column that gives you advice you didn't know you didn't want. Today I'm tackling a question that has stumped the friendless and sociopathic for years. Dear Nicole, When is it okay to eat off of someone else's plate? I'm really glad I've asked myself this question. They say that possession is 9/10th of the law. I will say that having a plate in front of you is normally a sign of possession, and food that enters a mouth is somewhere around 10/10ths possession, except in the case of unfortunate make-out timing, when you will be forced to share custody of the food. So, as you can see, having a plate is not the same as owning the food that is on that plate. That doesn't mean you shouldn't follow some food-sharing protocols. But what are these protocols, I ask myself? When can I steal a bite of food from a plate that I've now decided has far superior food than what I ordered and dammit I knew I should have gotten the special? OKAY! The plate belongs to your child. You bought the food. You own it. You can and should eat those fries while they are still hot. NOT OKAY! The plate belongs to someone else's child. Don't be weird. Seriously, no. OKAY! Eating off of your lover's plate while out for a romantic dinner for two. Hey, what's good for The Lady and the Tramp is good for non-animated humans. That's amore! NOT OKAY! Eating off of the stranger's plate next to you at the bar. This is how Ebola spreads. Well, that's what I heard. OKAY! Out with girlfriends sharing a plate of delish appys! Why, this is how an entire subset of humans eat out. I actually know a woman who has never ordered an entire meal just for herself, deftly living on shared sandwiches and appetizers for the last 13 years. Brava, food-sharing enthusiast! NOT OKAY! Soup sharing. Soup is a mixing bowl for blood from someone else's diseased gums, errant body hairs from sous chefs, and sneezes. Don't make it worse by dipping your saliva-slicked spoon in there. OKAY! At a party where plates are as limited as the seating options. Find a friend, be cool, and ask him if he would scoop some mini-wieners on his plate because as long as he's already filling his Chinet . . .
NOT OKAY! At a party with people from work. Those people are probably disgusting. Sure, you sit across from Ed 40 hours a week, but do you really know if he washes his hands after going to the bathroom? I hope this has helped you to understand the finer points of plate-sharing etiquette. And remember, I'm answering the questions that no one is asking! So keep not sending me your letters!